Former gymnast Bruce Wright brings unconventional views to the tennis court. View a video on the high-set concept. Wright spent years watching a “huge amount of tennis on videotape” and, through study and experimentation with players, determined that this “high set” (high center of gravity) confers several major advantages. The high set results from “trying to stand as tall as possible,” Wright says, “moving while minimizing flexion of the knees and waist.” Doing so, he says, makes players quicker to the ball, improves their stamina (as it is less fatiguing than a “low set”), and puts less overall strain on the body, making injuries, especially knee injuries, less likely. 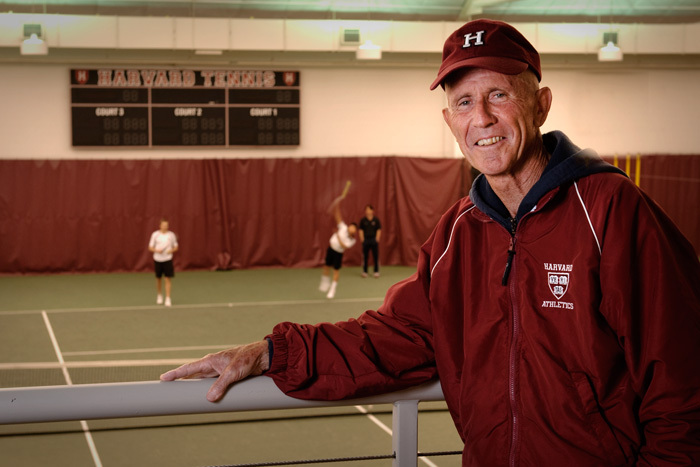 As a 66-year-old volunteer assistant coach at Harvard, he’s now working with Dave Fish, head men’s tennis coach since 1976, and assistant coach Andrew Rueb to bring this innovative concept to the Crimson varsity. Wright’s approach is contrarian because, almost unanimously, tennis coaches advise their students to “get low to the ball,” to move toward the ball from a modified crouch. “If you have to get down to hit the ball,” Fish explains, “the assumption is that you should get down to the ball as early as possible.” But Wright distinguishes crisply between “hitting stance” (one’s stance while actually striking the ball) and “moving stance” (how one holds one’s body while moving around the court between hits). “Nobody has paid any attention to moving stance because everyone is glued to the ball,” he explains. “But the efficiency of your hitting stance is determined by the efficiency of your moving stance. If you get there later, you’ll hit it badly.” Only on the final step before hitting the ball, he advises, should one lower the body to the degree necessary. After his gymnastics career at Springfield College, where he was nationally ranked in the rings (“A physical impossibility for someone as weak as I am,” he says, grinning), Wright went on to coach gymnastics there, and then at MIT and Annapolis, and to consult with the tennis squad at West Point. He took up tennis seriously after his epiphany watching Laver, and within two years was skillful enough to have made the naval academy’s varsity, according to their coach. Using his concept of high set, Wright then worked with several pro tennis players, including Stan Smith, winner of the 1971 U.S. Open and 1972 Wimbledon. Wright is now at work on a book titled “The Movement Myth” that describes his findings. He has even gone beyond high set into an analysis of the anterior/posterior axis that he feels can illuminate a long-overlooked physical source of error in athletics. Stay tuned.